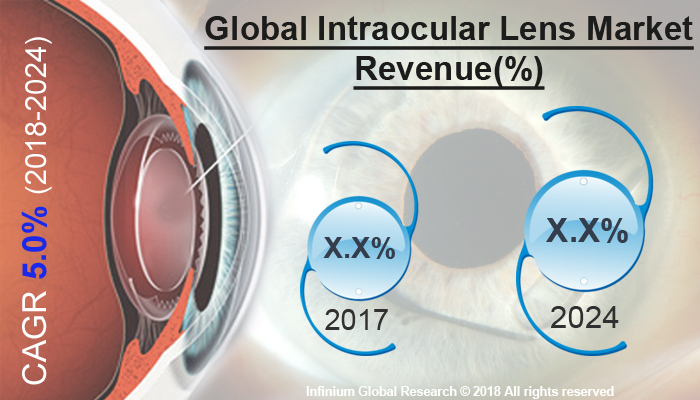 A recent report published by Infinium Global Research on intraocular lens market provides in depth analysis of segments and sub-segments in global as well as regional intraocular lens market. The study also highlights the impact of drivers, restraints and macro indicators on the global and regional intraocular lens market over the short term as well as long term. The report is a comprehensive presentation of trends, forecast and dollar values of global intraocular lens market. According to report the global intraocular lens market is projected to grow at a CAGR of 5% over the forecast period of 2018-2024. Intraocular lens is a lens inserted inside the eye to replace the eye's natural lens during cataract surgery. The major advantage of intraocular lenses are, they offer good and clear vision after cataract surgery. As the intraocular lenses have become well developed and are considered to be safe, they are accepted as the standard of modern cataract surgery. Additionally, Aspheric IOLs, Toric IOLs, Accommodating IOLs and Multifocal IOLs are the various types of the intraocular lens which is choose according to specific visual needs. According to the World Health Organization (WHO), nearly 7 million to 12 million cataract operations were performed in the year 2000 and 20 million cataract operation were performed in 2010. By the year 2020, cataract surgeries are anticipated to reach 32 million annually. The major factor such as rising geriatric population ocular conditions, incidence of cataracts are some of the key factors, driving growth in this market. Additionally, initiative taken by the government to remove avoidable blindness growing among aged population across the world are expected to fuel the growth of intraocular lens market. Moreover, the technological innovation in the intraocular lens is also responsible for enhancing the growth of this market. Going further growing number of vision correction procedure such as LASIK, cataract surgeries and others is responsible for significant growth in the intraocular market. However, the lack of proper coverage for premium IOLs and high cost related with surgical procedure are hindering the growth of intraocular lens market. In near future, accessibility of advance technologies such as micro-incision cataract surgery and femtosecond lasers may provide huge growth opportunities for the key players in the intraocular lens market. North America is holding a leading region among other geographies in the intraocular lens market and is expected to dominate throughout the forecast period. Improved reimbursements policies, rising the incidence of cataracts and government entities to set up eye care facilities have contributed for the growth in this market in North America region. Asia pacific accounted for the fastest growing in terms of revenue over upcoming year. The developing countries such as India and china are anticipated to be fastest growing economies in Asia pacific region. Owing to huge patient pool and growing the healthcare industry. The leading companies in the market are Abbott Medical Optics, Carl Zeiss Meditec AG, Bausch & Lomb, Inc., Alcon (Novartis AG), Calhoun Vision, Inc.,Staar Surgical Company ,Hoya Surgical Optics, Rayner Intraocular Lenses Limited, Oculentis GmbH. Some Key players investing in merger and acquisition for the expand product portfolio. The report on global intraocular lens market covers segments such as product, material, and end-user. On the basis of product the global intraocular lens market is categorized into monofocal IOL, multifocal IOL, toric IOL, and accommodative IOL. On the basis of material the global intraocular lens market is categorized into polymethyl methacrylate (pmma), silicone and hydrophobic acrylic. On the basis of end-user, the global intraocular lens market is categorized into hospitals, ophthalmic clinics, ambulatory surgery centers, and eye research institutes. The report provides profiles of the companies in the global intraocular lens market such as Abbott Medical Optics, Carl Zeiss Meditec AG, Bausch & Lomb, Inc., Alcon (Novartis AG), Calhoun Vision, Inc., Staar Surgical Company, Hoya Surgical Optics, Rayner Intraocular Lenses Limited and Oculentis GmBH. The report provides deep insights on demand forecasts, market trends and micro and macro indicators. In addition, this report provides insights on the factors that are driving and restraining the global intraocular lens market. Moreover, IGR-Growth Matrix analysis given in the report brings an insight on the investment areas that existing or new market players can consider. The report provides insights into the market using analytical tools such as Porter's five forces analysis and DRO analysis of intraocular lens market. Moreover, the study highlights current market trends and provides forecast from 2018-2024. We also have highlighted future trends in the intraocular lens market that will impact the demand during the forecast period. Moreover, the competitive analysis given in each regional market brings an insight on the market share of the leading players. This report will help manufacturers, suppliers and distributors of the intraocular lens market to understand the present and future trends in this market and formulate their strategies accordingly.